Damas Gratis (Spanish for "Ladies' Night", literally "Ladies for Free"), creators of the "cumbia villera” (from the word villa, the Argentine equivalent of Brazilian favelas) is undoubtedly the most important cumbia band in Argentina. Debuting in 2000 in San Fernando on the northern outskirts of Buenos Aires at the hand of Pablo Lescano, Damas Gratis is considered by many Argentinians as the "Maradona of Cumbia" and is today one of the great names in Latin American cumbia; for its history, its trajectory and the popular craze at each gig. Dozens of groups have been inspired by this great band; commonly called "cumbia villera", having spawned the diffusion of this undercurrent of cumbia, from Mexico to Patagonia, converting it as a standard bearer of the demands of the popular classes. This cumbiera villera, a soundtrack of Argentine ghettos, has for nearly two decades taken the place that the hip-hop movement occupies in our suburbs. Music has become the means of expression of the underprivileged classes. 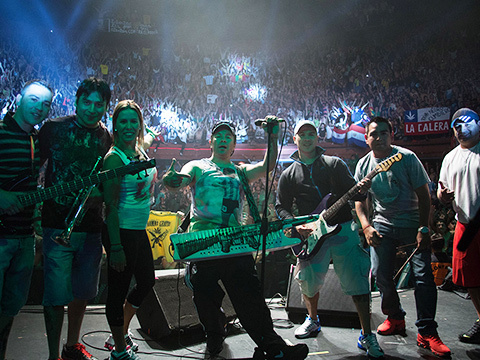 Pablo Lescano is also the first cumbia artist to play in the famous River Plate stadium "El Monumental" in front of 80,000 people, invited by Los Fabulosos Cadillacs in 2008.